It's the love month once again and just like any other couple, we also celebrate Valentine's day. 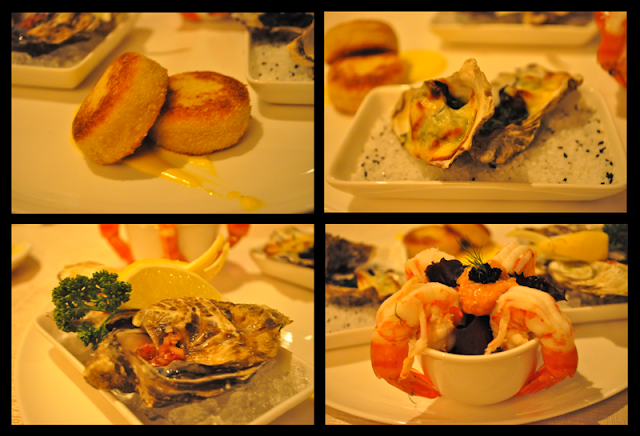 This year we were lucky enough to celebrate it at Oakroom Restaurant in Oakwood, Pasig courtesy of OpenRice Philippines. We were both delighted when we learned that our surprise dinner date would be in Oakroom. Last year, D surprised me with a fine-dining setup at his house with my favorite food in different restaurants. But we've never really celebrated Valentine's day in a fine-dining restaurant before. So we totally got excited and looked forward to this wonderful opportunity. The whole place was dimly lit with candles on each table for a more romantic and intimate ambiance. We were led to our seats and a few minutes later, two people from Openrice welcomed us. Raiza, asked D to sign something outside the room and when they came back, D handed me a bouquet of red roses. Sweet! Cocktails were first served to us followed by the complimentary basket of assorted bread and butter. The Amuse-bouche came in next which didn't last a minute after it was served on our table. Of course we had to take a photo of it first but after that.. gone. It was a Crostini topped with sliced cherry tomatoes and spread. I could taste the fusion of flavors the moment I popped the whole thing into my mouth. The fruitiness of the cherry tomatoes blended perfectly with the creaminess of the spread. How I wish it came in a bigger form. Up next was the platter of seafood appetizers. Each was well-presented by the waiter who was very attentive and friendly all throughout our dinner. Mini Crab Cakes- This was our favorite among them all. It was pure crab meat goodness inside. The dipping sauce which tasted like honey mustard went well with it too. Fresh Oysters- I don't eat raw oysters so I gave my share to D which he seemingly enjoyed very much. Rockefeller Oysters- I surprisingly liked this one. It didn't taste like oysters at all. It was just like a cheesy spinach dip in an oyster shell. Shrimp Cocktail-Also loved this one. The shrimps were fresh and plump paired with a special cocktail sauce. For our main course, I got the Salmon while D got the Chicken. I forgot what the dishes were called but all I can remember is that both were actually good. Lastly, dessert was served. It was a mini macaron with chocolate filling and a heart-shaped frozen raspberry sherbet. After our dinner the manager approached us and handed me a long-stemmed rose and a small red box compliments of the restaurant. He asked how the food was and if it was our first time to dine there. He greeted us a happy valentine's and hoped we enjoyed the dinner at the Oakroom. The curious me opened the small box and there were two small pieces of chocolates inside. I wanted to eat the chocolates but something inside me urged me to wait.. And I was right! A few minutes later we were each served with a small dish of chocolate truffles. At first, D and I were joking about having to go to Jollibee or Mcdo after since we doubted we'll be full with the three-course meal. But after our dinner, both of us felt really full. We were offered with some coffee or tea after our meal and went for the latter. It was truly a memorable night and a wonderful way to celebrate Valentine's. Thank you to OpenRice Philippines and Oakroom for making this occasion extra special. Awwww ... glad to hear you had a great Valentines. Ang ganda namn ng bouquet at mukhang ang sarap ng mga kinain nyo! Belated Happy Valentine's day sa inyong 2! Awesome dinner! And great photos! beautiful platings of the food. now, i have an unending list of resto to visit the next time I am in NCR. wow fine dining! :> the pink cake really caught my eye! what a romantic night you had! I spent my valentines in a date with my avaya, my work phone. lol! I wish I could have a fine dining experience here as well! for sure its romantic day for both of you .. I spent my valentine's with my daughter .. Perfect Valentines Day I suppose. It was a great place and great food for great couple like both of you. Would be really nice to have a three-course dinner with the boyfie. :) Thanks for dropping by, by the way! Aiiisssstt.... Kilig lang. If I will be the girl given this surprise, hindi ako makakakain sa kilig, hehe. Never the food hahaaha.. SAdly, we boys tend to make girls feel so special. Looks like the place is very classy. Hmm..cocktail. I love cocktail bars. A very romantic date. And you are a beautiful couple. What lovely and romantic place for your date in this Valentine's. The foods are great and they really enhance your love trip. Did I see oysters? Hmmm... RandomThoughts! senses something energy-enhancing food! :) Hope... you've enjoyed your romantic date on that day! Romantic! ^_^ saraaaap ng food! Sarap talaga ng In - love, I remember my younger days haisstttt. Very beautiful! I thought Oakwood's now called Ascot. Anyway you capture beautiful photos! wow good thing you had a great valentine unlike me.. hehe! the food look so yummy!! You two look good. :) That was a great way of spending Valentines Day... wine, chocolates, food and roses. Hehehe. Wow, one sweet date indeed!!! love the food.yummy. and love your blog design.colorful!! wow! what an awesome Valentine's day date! love the food pics! Anyway, your dinner looks yum! Happy valentines day! What a lovely and romantic setting. definitely 'di lang pang valentine's. ahh... All the best for the both of you. Such a romantic set-up!Love the last photo! The doors which remained locked up shows a minor outward bend found at the recent MAA Best Awards.